Don't forget, those caps and pills are not worth a penny without you committing to the all the lifestyle changes I outlined in episode one of this series. I am well aware that you had to wait for a full week for this 2nd part of the "Restore & Maintain Insulin Sensitivity" Series (read part I), so I am going to make no words about it and get straight to the annotated list of useful supplements. Just a reminder for the lazy asses: Don't even think about starting any of the supplements on the list, if you have not already cut your carbs to a low, but not very low level, got rid of all plain sugar in your diet, started to work out frequently, get enough sleep, avoid stims and control (not totally eradicate) your linoleic acid (omega-6) intake. Whenever I feel confident to do so, I will also suggest a concrete dosage - in some cases, such as GABA, I can however neither do the former, nor the latter, because there simply is too little quality research out there. Did you know that continuous use of metformin during pregnancy significantly reduced the rate of miscarriage, gestational diabetes requiring insulin treatment and fetal growth restriction in women with PCOS who have long been advised to stop metformin during pregnancy (cf. Nawaz. 2008)? Metformin [A]: Technically it is not a supplement, but let's be honest, who except for the FDA cares? Many supplements work as effectively as pharmacological drugs, but as far as real insulin sensitizers are concerned metformin still appears to have the edge on the rest of the pack (supplement or drug): It has an excellent safety profile (even in gestational diabetes, which has long been thought of being the one area of application, where metformin was not the first line intervention of choice; cf. Lautatzis. 2013). It works via a similar mechanisms as dieting and exercise does (→ AMPK; this is actually imho it's main advantage - an advantage it shares with lipoic acid btw.). And metformin has only recently been shown not to inhibit the benefits of exercise on glycaemic control or fitness (Boulé. 2013). Moreover, hundreds of studies support the preventive effects of metformin against the manifestation of tumors of pancreas, breast, colorectum, liver, endometrium and ovary. The prognosis of diabetic cancer patients on metformin therapy seems be better, than in diabetics without metformin treatment (Anděl. 2013). So, if you belong those people who have real issues and not just slightly elevated blood glucose levels, have your metformin prescription filled - it's unquestionable an [A] among the agents that can help you restore your insulin sensitivity [I don't have to tell you that this is not an agent you would use simply to stay insulin sensitive, right?]. One thing you should keep in mind though, is that it may lower your B12 levels. While this could be a simply results of increased usage and more recent studies question previous reports according to which metformin radically depletes B12 levels have been questioned lately, it probably won't hurt to take 500-1,000mcg of methylcobolamine alongside your metformin. Alpha lipoic acid (ALA) [A]: In a way lipoic acid, a naturally occuring organosulfur compound derived from octanoic acid, is a cousin of metformin. 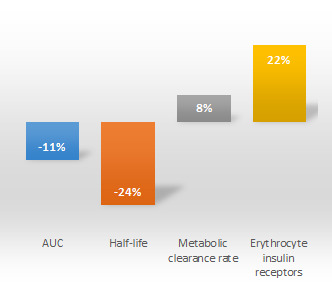 Unfortunately (for the future of alpha lipoic acid as an anti-diabetes agent and the diabetics who have ever since been treated with pro-obesogenic PPAR-agonists) the pharma industry realized that selling a natural and thus non-patentable anti-diabetes drug would not only generate a lower revenue, it would also hamper the sales of patentable and thus more profitable drugs. 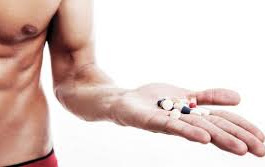 Don't take lipoic acid instead of working out. Why? Well, alpha lipoic acid has been shown to increase the arthesclerosis risk in a human trial by McNeilly et al. In the said study, 1g of alpha lipoic acid per day increased the cardiovascular disease risk, in 24 obese individuals with impaired glucose tolerance who participated in the experiment (McNeilly. 2012); the underlying mechanism was an increase in LDL oxidation that did albeit occur only in the "ALA only" but not the "ALA + exercise" group. Luckily, there are still more than enough animal and human studies (Jacob. 1999; Xiang. 2011; Porasuphatana. 2012) to support the beneficial effects lipoic acid will have on glucose management and hyperglycemic damage in (pre-)diabetics. In view of the fact that it could contribute to the development of heart disease precipitate hypoglycemic episodes (Khamaisi. 1990), has negative effects on appetite (which is the main mechanism by which it reduces weight gain in rodents) and appears to mess with lean mass gains - suggested reads ("You Could be Just as Lean, but More Muscular Without a Nutrient Repartitioner" (learn more); "Further Evidence Against Anti-Oxidant Supplementation: Vitamin E + Alpha Lipoic Acid Reduce Skeletal Muscle Mitochondrial Biogenesis" (read more) I would still not suggest you take high doses (>100-200mg) if you don't have problems with keeping your blood sugar levels in check. For those of you, who have established problems with managing their glucose levels, taking 2x250mg-600mg (with meals) would yet be a good point to start from (keep an eye on how it affects your glucose levels and adjust the dosage appropriately). With respect to the purported superiority of R-ALA vs. the regular (=racemic mixture) version of lipoic acid, I can only repeat that I am still waiting for someone to show me a study that would prove that R-ALA is more potent than regular the cheap racemic mixture that's been used in the vast majority of the currently available (mostly beneficial) studies. GABA [? ]: No, the reason GABA (Gama-aminobutyric acid) is on the list is not that it will make you sleep better (although this may - for some(!) people, actually be the case). It's rather its direct protective and even restorative effect on pancreatic beta-cells (Soltani. 2011; Tian. 2013). Despite the fact that we have known about these effects for decades, up to now nobody seems to be interested to do or finance the research that would be necessary to make concrete and reliable dosage-recommendations. In fact, the evidence is still so scarce that we cannot even say: "Yes, GABA is definitely going to help" - if the prelminary evidence we have translates from the petri dish to the rodent cage and into the real world, it could however be the #1 agent on this list. Why? Well, this would basically mean that it could cure diabetes even when you have progressed from being insulin resistant to being a full-blown diabetic. Beware of high dose GABA (>3g) supplementation on empty! Those 100mg of GABA are very unlikely to have any negative effects on your health. With higher amounts, on the other hand, specifically if they are taken on empty and thus rapidly absorbed, side effect can occur. Anxiety, slowed breathing, weakness, they all are probably caused by peripheral effects (not in the brain), but this does not make them desirable, either. So practically speaking this means that you best stick to low / divided doses and if you take more, take it with food. The best evidence we have that this could in fact be the case does probably come from a 2011 study by Soltani, who have actually taken the important step from the petri dish to the rodent model and were able to show that GABA restores β-cell mass and reverses diabetes in severely diabetic mice. Warning: Don't start out with 5g of GABA in one serving - esp. not on an empty stomach. This is not only going to give you parestesia (tingles), but could also have you gasp for air and have problems keeping on your feet, due to the profound actions on peripheral GABA receptors. 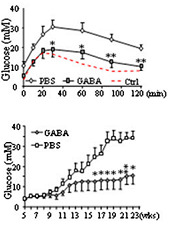 Furthermore, human studies from the eighties have shown that 5g and 10g of GABA (consumed orally) exert direct insulinotropic effects (remember insulin resistance is not about too much insulin, but about the latter having no / too little effect on glucose uptake) and since oral GABA does not cross the blood-brain-barrier it's safe to be consumed by humans in relatively high doses (cf. Cavagnini. 1982). Still, as in the case of lipoic acid, GABA is not patentable and the stocks of the big players in the anti-diabetes drug business would certainly take a tumble, when someone actually proved that you could reverse diabetes by simply taking X grams of GABA everyday. Taurine [B]: You will remember that I mentioned Taurine only 2 days ago in the context of the anti-diabetic effects of whey protein (read more). You will probably also remember the numerous previous posts on the beneficial effects of taurine specifically for people with diabetes or pre-diabetes (learn more about taurine). I will therefore stick to a brief overview of the direct and indirect (protection against negative effects of high blood glucose) benefits taurine has to offer for people with insulin resistance and high glucose levels. 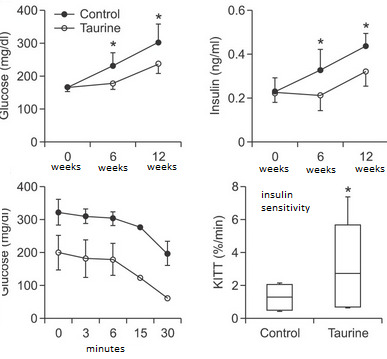 Figure 2: The effects of taurine supplementation on glucose and insulin (top, left & right) 0, 6, and 12 weeks after beginning the taurine-supplemention in OLEFT rats (rodent model of diet induced diabesity), as well as the reaction to an insulin tolerance test and corresponding changes in insulin sensitivity (bottom, left & right; adapted from Kim. 2012). It should be mentioned thought that there are also studies which did not support the beneficial results reported above - they are not numerous, but may yield some insights into effective vs. uneffective dosage regimen. The 1.5g/day the overweight subjects with a predisposition for developing diabetes the subjects in a 2004 study by Brøns et al. received, may for example simply have been too little to exert any effects (Brøns. 2004). Based on the human equivalents of rodent studies, it appears most promising to distribute a daily taurine intake of 3g to max. 6g over your three main meals. Since taurine does also act as a gaba-ergic small molecule neurotransmitter (Albrecht. 2005), I would yet suggest you keep a close eye on (a) initial sedative effects and (b) longer term increases in anxiety - both of which have been reported in animal studies with allegedly higher and / or intracerebral administration of taurine. The effects on neurotransmitters, the diarrhea some users experience (esp. when they take it without food) and the fact that many, but by far not all studies confirmed direct inusulin sensitizing effects of taurine are the reason I'd still classify it as [B] level supplement - certainly one of the better ones, but still only "possibly beneficial". Green tea extract [C]: GTE can help with insulin sensitivity in two different ways. Firstly, it will help control the inflammatory processes that are (partly) responsible for the development of insulin resistance and it will secondly help you to "cut carbs" by simply blocking their digestion and assimilation (Forester. 2012; Williamson. 2013). And while the real world benefits of GTE supplementation in a 2012 study by Hsu et al. were not statistically significant, it may still be worth trialling a dose of 3x 200-500mg per day. 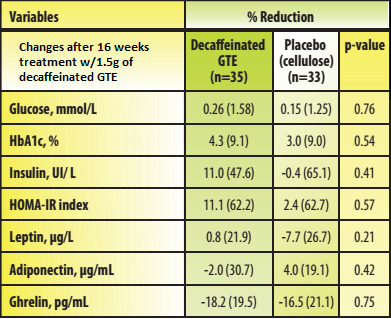 That being said, unless you are specifically looking for the stimulant effects of GTE, you should consider using a decaffeinated extract because you do not really need the additional caffeine (cf. part I of this series). The reason I still classified GTE as [C] as in "marginally useful" is that the study by Hsu is not the only human trial that did not find significant effects on insulin sensitivity. It is rather one of the few where you could actually argue that - though not significant - it may have had an independent effect on glucose management. 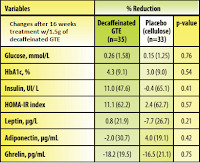 In the majority of studies "green tea exhibited limited benefits in reducing FBS or HbA1c levels" and as Ruitang Deng puts it in his recent review: "Should not be recommended for managing hyperglycemia." (Deng. 2012) This does not mean that it cannot help ameliorate the side effects, but we are looking for agents that will actually help you lower your blood glucose levels and in this regard green tea extracts are only marginally useful. Amla, gooseberry, or Emblica Officinalis call it whatever you want, but don't expect too much - it may work, but it's no comparison to the [A]-class supplements. Moreover, the results from the available human study could be distorted by additional ingredients in the supplement formulas the scientists used. Gooseberry (emblica officinalis) [C]: Studies by Mitra (2007), Faizal (2009), Iyer (2009) and Chen (2011) all provide evidence that the ingestion of extracts from Indian gooseberry (=Amla), an edible fruit from trees of the phyllanthaceae family can effectively improve blood glucose management. Due to the fact that the Gooseberry extract was administered in conjunction with other agents, it is however difficult to suggest an effective dosage, but it appears as if 100-150mg per day of gooseberry extract would be enough. In Iyer et al. even a single serving of fresh amla (~35g) got the job done, but the overall effect size is rather mediocre, thus Gooseberry is only "possibly useful" [C]. Fenugreek [B]: Also known as trigonella foenum-graecum L., fenugreek belongs to the plant family fabaceae (or leguminosae). Fenugreek seeds and extracts from the leaves have a decent amount of studies to support its anti-hyperglycemic effects - including clinical studies with human volunteers showing that dosage of only 500 mg of seed or leaf extracts given once or twice daily either alone or in combination with standard, synthetic anti-diabetic drugs such as metformin and glipizide provided beneficial effects on controlling plasma glucose levels (Deng. 2012). The reason I'd still classify it as [B] are (a) the fact that it takes a huge amount of the seeds (e.g. 25g; see figure 3) to elicit significant effects and (b) the fact that studies using extracts yielded ambiguous results. Contrary to the whole seeds, of which it seems that they exert their beneficial effects by similar mechanisms as dietary fiber, leaf extracs appear to exert a direct insulin sensitizing effect. In a study by Abdel-Barry et al. from the year 2000, 40 mg/kg aqueous extract powder from fenugreek leaves(!) in 10 mL distilled water lowered the glucose levels of 20 healthy male volunteers aged 20-30 years by 13.4% 4h after ingestion. Unfortunately, the hunger, frequent urination and dizziness one third of the subjects complained about, was not the only side effect - the subjects also had significantly reduces serum potassium levels; an observation of which the researchers rightly state that it warrants further investigation to ensure the long-term safety of fenugreek leaf extracts. Bottom line? Well, once again "possibly useful", but only if you actually have problems with insulin resistance and high blood sugar. "What? Where is there rest?" In case this is pretty much what you are thinking right now, I can calm you down, there will be at least another serving of pro-insulin sensitivity supplements. I simply don't have the time to write more today, but did not want to go back on my promise from last Sunday. So, be patient, there is going to be more: Promising supps such as cinnamon, vinegar, or grape seed extract, for example but also questionable stuff such as bitter melon or legume extracts. Abdel-Barry JA, Abdel-Hassan IA, Jawad AM, al-Hakiem MH. Hypoglycaemic effect of aqueous extract of the leaves of Trigonella foenum-graecum in healthy volunteers. East Mediterr Health J. 2000 Jan;6(1):83-8. Anděl M, Skrha P, Trnka J. [Metformin: the overlap of diabetology and oncology]. Vnitr Lek. 2013 Aug;59(8):738-42. Boulé NG, Kenny GP, Larose J, Khandwala F, Kuzik N, Sigal RJ. Does metformin modify the effect on glycaemic control of aerobic exercise, resistance exercise or both? Diabetologia. 2013 Aug 23. Brøns C, Spohr C, Storgaard H, Dyerberg J, Vaag A. Effect of taurine treatment on insulin secretion and action, and on serum lipid levels in overweight men with a genetic predisposition for type II diabetes mellitus. Eur J Clin Nutr. 2004 Sep;58(9):1239-47. Cavagnini F, et al. Effects of gamma aminobutyric acid (GABA) and muscimol on endocrine pancreatic function in man.Metabolism. 1982; 31:73–77. Chen TS, Liou SY, Wu HC, Tsai FJ, Tsai CH, Huang CY, et al. Efficacy of epigallocatechin-3-gallate and amla (Emblica officinalis) extract for the treatment of diabetic-uremic patients. J Medicinal Food. 2011;14:718–23. Dalaklioglu S, Kuscu N, Celik-Ozenci C, Bayram Z, Nacitarhan C, Ozdem SS. Chronic treatment with taurine ameliorates diabetes-induced dysfunction of nitric oxide-mediated neurogenic and endothelium-dependent corpus cavernosum relaxation in rats. Fundam Clin Pharmacol. 2013 Jun 14. 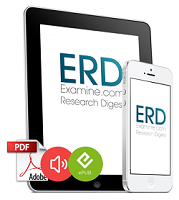 Deng R. A review of the hypoglycemic effects of five commonly used herbal food supplements. Recent Pat Food Nutr Agric. 2012 Apr 1;4(1):50-60. El Zahraa Z El Ashry F, Mahmoud MF, El Maraghy NN, Ahmed AF. Effect of Cordyceps sinensis and taurine either alone or in combination on streptozotocin induced diabetes. Food Chem Toxicol. 2012 Mar;50(3-4):1159-65. Faizal P, Suresh S, Satheesh Kumar R, Augusti KT. A study on the hypoglycemic and hypolipidemic effects of an ayurvedic drug Ra-janyamalakadi in diabetic patients. Indian J Clinical Biochem. 2009;24:82–7. Mitra A. Effects of a composite of tulsi leaves, amla bitter gourd, gurmur leaves, jamun fruit and seed in type 2 diabetic patients. J Clinical Diagnostic Research. 2007;6:511–20. Forester SC, Gu Y, Lambert JD. Inhibition of starch digestion by the green tea polyphenol, (-)-epigallocatechin-3-gallate. Mol Nutr Food Res. 2012 Nov;56(11):1647-54. Franconi F, Bennardini F, Mattana A, Miceli M, Ciuti M, Mian M, Gironi A, Anichini R, Seghieri G. Plasma and platelet taurine are reduced in subjects with insulin-dependent diabetes mellitus: effects of taurine supplementation. Am J Clin Nutr. 1995 May;61(5):1115-9. Franconi F, Di Leo MA, Bennardini F, Ghirlanda G. Is taurine beneficial in reducing risk factors for diabetes mellitus? Neurochem Res. 2004 Jan;29(1):143-50. Jacob S, Ruus P, Hermann R, Tritschler HJ, Maerker E, Renn W, Augustin HJ, Dietze GJ, Rett K. Oral administration of RAC-alpha-lipoic acid modulates insulin sensitivity in patients with type-2 diabetes mellitus: a placebo-controlled pilot trial. Free Radic Biol Med. 1999 Aug;27(3-4):309-14. Imae M, Asano T, Murakami S. Potential role of taurine in the prevention of diabetes and metabolic syndrome. Amino Acids. 2012 Dec 8. Ito T, Schaffer SW, Azuma J. The potential usefulness of taurine on diabetes mellitus and its complications. Amino Acids. 2012 May;42(5):1529-39. doi: 10.1007/s00726-011-0883-5. Epub 2011 Mar 25. Iyer U, Joshi A, Dhruv S. Impact of Amla (Embilica Officinalis) supplementation on the glycemic and lipidemic status of type 2 diabetic subjects. J Herbal Medicine and Toxicol. 2009;3:15–21. Khamaisi M, Rudich A, Potashnik R, Tritschler HJ, Gutman A, Bashan N. Lipoic acid acutely induces hypoglycemia in fasting nondiabetic and diabetic rats. Metabolism. 1999 Apr;48(4):504-10. Kim SJ, Ramesh C, Gupta H, Lee W. Taurine-diabetes interaction: from involvement to protection. J Biol Regul Homeost Agents. 2007;21(3-4):63-77. Lautatzis ME, Goulis DG, Vrontakis M. Efficacy and safety of metformin during pregnancy in women with gestational diabetes mellitus or polycystic ovary syndrome: A systematic review. Metabolism. 2013 Jul 22. Li C, Cao L, Zeng Q, Liu X, Zhang Y, Dai T, Hu D, Huang K, Wang Y, Wang X, Li D, Chen Z, Zhang J, Li Y, Sharma R. Taurine may prevent diabetic rats from developing cardiomyopathy also by downregulating angiotensin II type2 receptor expression. Cardiovasc Drugs Ther. 2005 Mar;19(2):105-12. McNeilly AM, Davison GW, Murphy MH, Nadeem N, Trinick T, Duly E, Novials A, McEneny J. Effect of α-lipoic acid and exercise training on cardiovascular disease risk in obesity with impaired glucose tolerance. Lipids Health Dis. 2011 Nov 22;10:217. Nawaz FH, Khalid R, Naru T, Rizvi J. Does continuous use of metformin throughout pregnancy improve pregnancy outcomes in women with polycystic ovarian syndrome? J Obstet Gynaecol Res. 2008 Oct;34(5):832-7. Raghuram TC, Sharma RD, Sivakumar B, Sahay BK. Effect of fenugreek seeds on intravenous glucose disposition in non-insulin dependent diabetic patients. Phytotherapy Research. 1994;8:83–6. 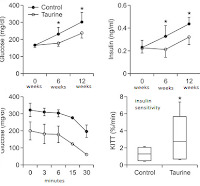 Schaffer SW, Azuma J, Mozaffari M. Role of antioxidant activity of taurine in diabetes. Can J Physiol Pharmacol. 2009 Feb;87(2):91-9. Soltani N, Qiu H, Aleksic M, Glinka Y, Zhao F, Liu R, Li Y, Zhang N, Chakrabarti R, Ng T, Jin T, Zhang H, Lu WY, Feng ZP, Prud'homme GJ, Wang Q. GABA exerts protective and regenerative effects on islet beta cells and reverses diabetes. Proc Natl Acad Sci U S A. 2011 Jul 12;108(28):11692-7. Tian J, Dang H, Chen Z, Guan A, Jin Y, Atkinson MA, Kaufman DL. GABA regulates both the survival and replication of human ss-cells. Diabetes. 2013 Aug 30. Williamson G. Possible effects of dietary polyphenols on sugar absorption and digestion. Mol Nutr Food Res. 2013 Jan;57(1):48-57. Xiang G, Pu J, Yue L, Hou J, Sun H. α-lipoic acid can improve endothelial dysfunction in subjects with impaired fasting glucose. Metabolism. 2011 Apr;60(4):480-5.